This is the foundation on which the agency-client relationship is built. Nobody likes radio silence or dead air. We always respond to our clients’ emails — even if it’s just to acknowledge that we received what they sent us. It’s common courtesy and it provides reassurance that we’re moving a project forward. We hear our clients, and we want them to know that. If there’s a chance to get a lot more for just a little more, we want our clients to know. For example, we can find opportunities for clients to bring down costs per unit by strategically using quantity pricing. That means clients are able to maximize their budget and reach a larger audience in a cost-effective way. We think every task through to the end. Our job is to make our clients’ jobs as easy as possible. So, we investigate every task to find potential pain-points. That way, we have solutions before problems arise and answers before questions are asked. 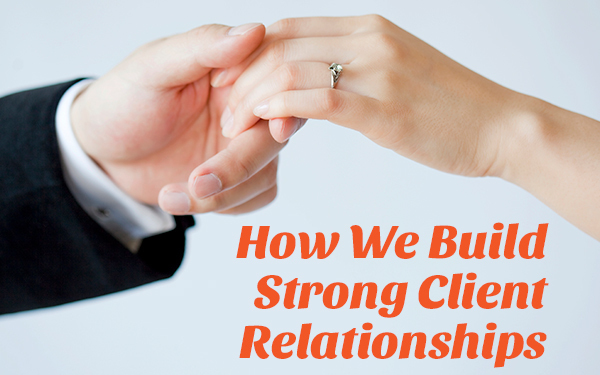 When we nurture our strong agency-client relationships, we become so in-tune with our clients that we start to know them better than they know themselves. We’re here to listen. We keep clients at the center of our attention. We communicate simply and say what needs to be said succinctly. Work in this industry moves quickly, and we don’t want to bog our clients’ projects down with unnecessary back-and-forths. Want an agency that really listens? We’re all ears.